“Paris this 29/19 Jan. 1650 S[til]o N[ov]o.” Detail of Folger X.c.92 (3). It reads “Paris this 29/19 Jan. 1650. So. No.” where “So. No.” stands for “stilo novo,” meaning “in the new style.” Clearly, “stilo novo” refers here to the (single) year because there is no ambiguity about the day: “29/19 Jan.” gives both options. That is, it’s still 19 January if you’re using the Julian calendar (as the English did at the time), but already 29 January if you’re using the Gregorian calendar (as they did in Paris, where Englishman Sir Richard Browne wrote this letter). It’s not that much different from scheduling a conference call with participants in Chicago and DC at “2pm Central/3pm Eastern.” But why did Browne have to specify that 1650 is “in the new style”? The short answer is that he didn’t want to write “29/19 Jan. 1649/50.” The long answer is more complicated. For a detailed yet clear explanation, see A Handbook of Dates for Students of British History, edited by C.R. Cheney, revised by Michael Jones. Cambridge University Press, 2000, pages 8-14. For a more informal version, keep reading. The problem of old style and new style years hinges on the question of what day a new year begins. I hope it’s not too bold to say that, intuitively, the first day of a new year should be numbered “1” whether it’s 1 January, 1 Muharram, 1 Tishrei, or whatever. Things got confusing for early Christians because the first day of the calendar (long established as 1 January, thanks to the Romans) didn’t quite work with the system of counting years as beginning with Christ’s birth on 25 December. Fortunately, 25 December and 1 January are close enough to each other that it wasn’t too troubling to have a few days of overlap. Unfortunately for future historians, however, theologians in the 9th century began to argue that years of the Christian Era should advance on 25 March, because that’s when Christ was incarnated (“made flesh”) in his mother’s womb. That day is commemorated in the Christian church as the Feast of the Annunciation, commonly known as “Lady Day” in English because it commemorated the day that the angel Gabriel announced to “Our Lady” the Virgin Mary that she would be the mother of Christ. The idea that year numbering advances annually on 25 March took hold at different times in different places. It became common in England by the late 12th century, but 1 January remained the first day of the calendar when reciting the months, listing feast days, issuing almanacs, etc. 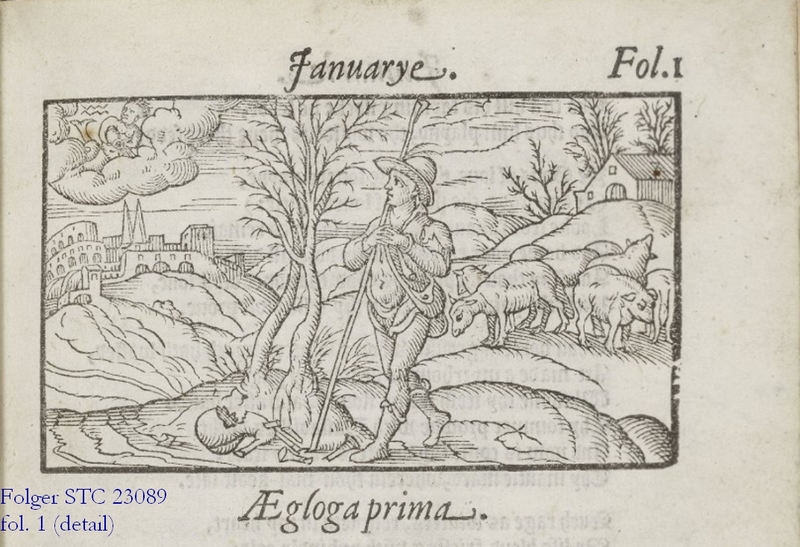 Detail from Folger STC 23089 showing January as the first month of the Shepherd’s Calendar. Lady Day dating (where the year changes to the next number on 25 March) and the Julian calendar (which was ten days “slow” by the 16th century) are commonly conflated thanks to Pope Gregory XIII ‘s calendar reform, which eliminated both oddities. He declared that Thursday, 4 October 1582 would be followed by Friday, 15 October 1582 and that the year number would now advance on 1 January, not 25 March. Roughly speaking, areas under Catholic control adopted both Gregorian reforms, areas under Protestant control did not, and areas that went back and forth between Catholic and Protestant control went back and forth. It’s especially important for researchers working with British documents to remember that Lady Day dating (affecting year numbering every 1 January through 24 March) and the Julian calendar (affecting day numbering year round) are separate because they were not modernized at the same time. Scotland officially dropped Lady Day dating after 31 December 1599, which was followed by 1 January 1600, but continued to use the Julian calendar until Wednesday 2 September 1752, which was followed by Thursday 14 September 1752. England and Wales also switched from the Julian calendar in September 1752, but had already modernized year numbering the previous January (31 December 1751 was followed by 1 January 1752). Catalogers often face this issue when arranging documents in chronological order: if one receipt says “12 February 1624” and another says “5 December 1624” that looks fine, and would be fine if the first receipt were Scottish. But if the first receipt is from England, it needs to be dated “12 February 1624/25” in the catalog and filed after the second receipt. 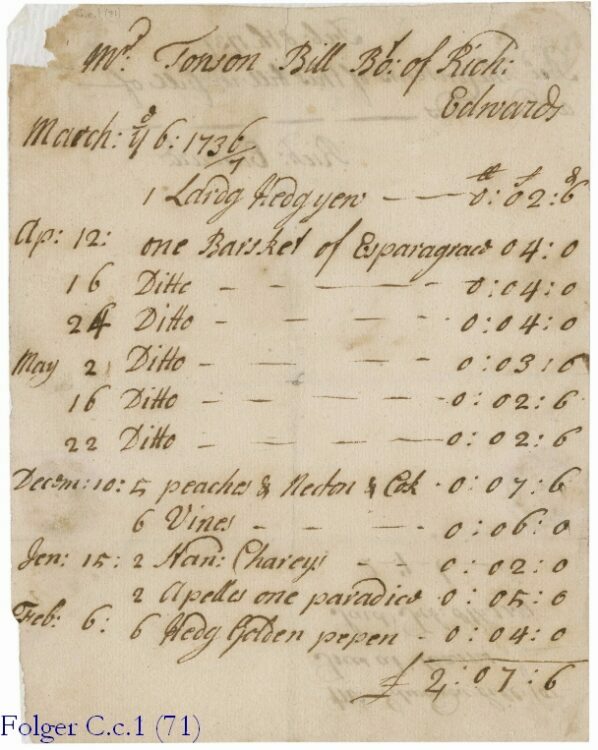 It’s always a huge relief when the document in hand was double-dated in the first place, like Folger C.c.1 (71), a bill with a tally that begins on “March [th]e 6, 1736/7” — that is, in 1737 by modern reckoning. When the year isn’t doubled, and the day falls in the range from 1 January through 24 March, catalogers just have to remember to include the modernized year when they’re dealing with a time and place that used Lady Day dating for the year (Descriptive Cataloging of Rare Materials 4D2.5 states “transcribe the date as it appears and supply the Gregorian year in square brackets. Make a note to indicate the basis for the supplied year. Do not amend the month and day, if present, by supplying Gregorian equivalents.”)2 The MARC coding underlying catalog records allows both years to be machine-readable in an online environment. 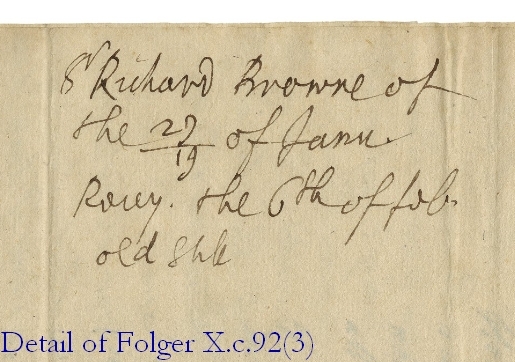 I’d like to give the final word here to my new favorite manuscript, the letter that Sir Richard Browne wrote in Paris “this 29/19 Jan. 1650 S[til]o N[ov]o,” because it has an a extra bonus on the back. When folding and labeling it for storage, the recipient gave the day of sending in both Julian and Gregorian reckoning (“Sr. Richard Browne of the 29/19 of Janu.”), but gave the day of receipt only in the Julian reckoning (“Recey. the 6th of feb. old stile”). In other words, this one piece of paper contains examples of both types of early modern dating weirdness, and uses old style/new style to refer to each in turn: the year numbering on the front, and the Julian 10-day discrepancy on the back. In Roman times, astronomers calculated that making every fourth year 366 days long instead of 365 would keep the days and the recurring seasons well enough synchronized. In fact, the seasonal year is slightly less than 365-1/4 days, so once every four years is a little too often. That is why the modern calendar declared by Pope Gregory XIII makes every fourth year a leap year except “century” years that cannot be evenly divided by 400 (so the years 1700, 1800, and 1900 each had 365 days; the years 1600 and 2000 each had 366). Things are even more complicated in 15th and 16th-century France, as the official new year started on Easter Sunday and so moved around March and April year by year. But new year gifts (‘étrennes’ or ‘strenae’ in Latin) were given at the beginning of the Roman year on 1 January. Sir W. W. Greg contributed a useful article on this subject to the festschrift for Joseph Quincy Adams, the first Director of the Folger. Greg, W. W. (Walter Wilson), 1875-1959. “‘Old Style — New Style. '” In Joseph Quincy Adams : Memorial Studies., edited by James G. McManaway, Giles E. Dawson and Edwin E. Willoughby, 563-69. Washington, D.C.: Folger Shakespeare Library, 1948. Republished in his Collected Papers, edited by J.C. Maxwell, Oxford : Clarendon Press, 1966, 366-73.